Sharp is a legendary name in consumer electronics. But being a leader in digital technology does not exempt a company from the realities of doing business in our not-so-paperless economy. Like most companies, Sharp received as much as two-thirds of its vendor invoices on paper. It also pushed out payments by check, adding its own stream of paper to the flow. Stuart Clancy, Senior Director for Corporate Purchasing and Accounts Payable, thought there had to be a better way. With the goal of reducing costs, he successfully outsourced check and ACH disbursements. This first success with process automation whetted his appetite for more. Before Stuart became aware of IPS' invoice automation services, he began investigating other companies at a trade show in Las Vegas. It turned out to be an 8-month odyssey vetting 14 companies, gradually reducing the list of candidates to two. And even those two really didn't meet the needs of Sharp. Both candidates were Indian business process outsourcers that would do all the processing offshore. Though a final decision was near, Stuart was worried about quality in dealing with a 100% offshore processor and security concerns in giving the company access to Sharp’s SAP platform. Fortunately, he came across IPS, a company he had not previously heard of, based in Sharp’s home state of New Jersey. After a good first call with IPS’ sales team, Stuart asked for references. “When I get references,” he says, “I never call the first few companies on the list. Those are the ones who will always say nice things. I go to the bottom and work my way up.” What he heard from the people on the bottom of the list sounded almost too good to be true. They couldn’t say enough positive things about the company, its staff and its systems. So Stuart paid a visit to the company’s processing center in Secaucus and came away even more impressed. He took his CFO and Treasurer to visit, and the company’s technology, security and processes impressed them as well. IPS’ Vice President of Operations, Cathy Ferro stressed that she and her team would be available to them throughout the entire start-up process. Every meeting, she promised. While it seemed too good to be true, IPS made Sharp Electronics' decision simple. 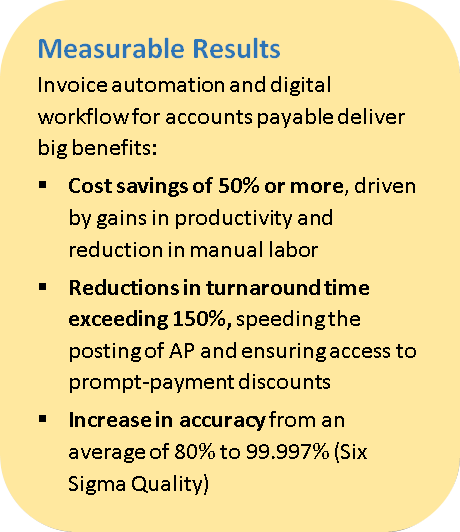 Over the next month, IPS developed a customized accounts payable solution for Sharp. The solution was built on the following platforms. IPS Digital Mailroom: the point of entry for incoming vendor invoices, whether mailed, emailed or uploaded through the IPS Vendor Portal. Invoices received in any format are automatically entered into the IPS process. IPS Intelligent Capture: the means to extract invoice accounting data from any invoice. IPS' unique mix of technology, automation and human intelligence generates the highest accuracy in the industry. IPS Digital Workflow: the platform that streamlines the digital process. Custom business rules automate routing and invoice approvals. The workflow is a cloud-based tool with a real-time dashboard to monitor performance and progress of invoices and payments into your accounting system. IPS ImageServ℠: the secure digital document repository. At the end of the approval process, ImageServ provides secure storage and instant retrieval of the digital documents in the cloud. IPS Subject Matter Experts quality control measures guarantee 99.997% accuracy. Unlike the offshore companies first considered by Sharp, IPS provides a single point of contact onshore in the US. This difference along with IPS quality helped determine Stuart’s final decision. This performance convinced Stuart to start planning to have IPS take care of invoice and PO matching as well in the future. And what about that promise from the Vice President of Operations, Cathy Ferro, to be there through thick and thin? “She was,” says Stuart. “She or one of her key staff was in every meeting. If something needs to be done quickly, it got done. I’ve never seen anything like it”.